A new season is here for Ole Miss Basketball, and with it comes a new approach for this year’s team: speed. And Rebels’ head coach Andy Kennedy may just have the pieces in place for his team to run a fast-paced offense. But first, Kennedy has to figure out who will be the captain of the ship on the court. 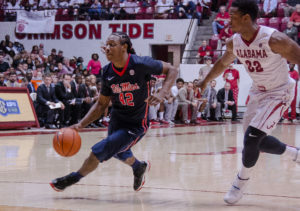 One familiar face all Rebels will be glad to have back is senior shooting guard Stefan Moody, who is the leading returning scorer (16.6 ppg) in the Southeastern Conference. Two new faces will join him from the junior college ranks, guards Sam Finley and Rasheed Brooks. For the first time in four seasons, the Rebels are in search of a point guard, following the graduation of four-year starter Jarvis Summers. Ole Miss could possibly have the answer in Finley, who played as a freshman at Cal-Riverside where he averaged 12.5 points per game, but sported a 15.2 points per game average in Big West Conference contests. Finley’s stellar play for the Highlanders earned him the Big West Conference’s 2013-14 Sixth Man of the Year award. Just a season ago, Finley, a California native, averaged 17.4 points in 30 minutes of action for Howard College. “Sam Finley is the guy that if we started a game today and thank goodness we don’t, but if we started a game today he would have the ball and he would be the guy that we would be depending upon to lead us,” Kennedy said. He’s 6-1, about 190-pounds. He’s athletic. He’s strong. He’s very fast with the ball. He can make shots, has a scorer’s mentality. And he’s been really receptive to a lot of things that we thrust upon him for this stage. Finley is similar to his new teammate, Moody, in terms of basketball background. Both players played at the Division 1 level as freshmen, then spent a season at the junior college level as sophomores before making their way back to Division 1 basketball. Another key point to factor in is that both Finley and Moody have the mindset of a shooting guard, not a point guard. Now, Finley will need to grow comfortable with a position that was left with question marks after the graduation of Summers, one of the Rebels’ all-time greats, who averaged 12 points per game last season. Kennedy realizes it will be a learning experience for the scoring-combo guard. Outside of Finley, Kennedy has another option in freshman point guard J.T. Escobar, who committed to the University of Mississippi a season ago, but opted for prep school since the Rebels were logged with experienced guards. In just one season at Elev8 Prep in Delray Beach, Florida, Escobar, 6-foot-2, 177-pounds, averaged 15 points, four rebounds, and four assists per contests. Arguably considered as his best scoring performance, Escobar scored 62 points in a game against prep powerhouse Oak Hill Academy. The Rebels will open up the season with an exhibition game at home against Clayton State on November 5 at 6:00 p.m. (CT).